Leizhan hi-tech ISO certificate testliner paper making machine applied to advanced technology and state-of-art spare parts introduced from abroad. In June 2014, Leizhan supplied oman a testliner paper making project for a paper mill. The pulp mill is located in Oman, southwest of Asia. Leizhan’s offering consists of stock preparation system and paper making equipment. Scope of supply range from watse paper conveyor to reeling machine. 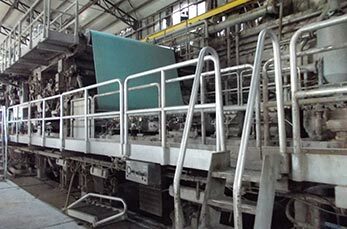 The new conditon paper machinery Leizhan supplied for paper pulp processing system contains chain converyer, cleaning devices like high density cleaner and low density cleaner, screening equipment like mid consistencly screen and inflow screen, refining machine like Double disc refiner and claflin refiner, etc. The waste paper recyling paper machine can produce 50 tons testliner paper daily with a net width of 2400mm. The paper machine has a productivity ratio of 160-210g/m2 and machine speed of 90m/min. 1. The motor of mid consitency pressure screen applied to simens, ABB and other high grade device. 2. One time bend forming of the motor ensures the stable running of the machine. 3. Double machanical seal of the machine can protect the bearing. 4. Finland seal water flow automatic detection alarm device makes sure the system runs satety. 5. Devices contact with the paper pulp applied to SS304 stainless steel material. 6. Interlock system ensures the service life of equipment.